The second energy center – the water chakra – offers direct access to flow, flexibility, and fun. It deals with pleasure, and is blocked by guilt. Take a look at all the guilt which burden you. What do you blame yourself for? What can you let go of that block this chakra? I acknowledge my uniqueness. I am sensual and creative being. I attract only whole and nurturing relationships into my life. My senses are alive and connected. I embrace life with passion and feel abundant joy. I am radiantly beautiful, healthy and strong. 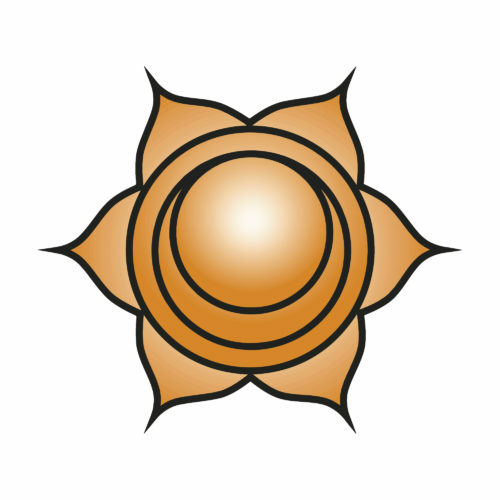 Symbol: Lotus with a crescent moon within and six vermilion, or orange petals. Mudra: Shakti Mudra – This feminine mudra works to harness sexuality and sensuality. Essential Oil: Ylang ylang, Sandalwood, Clary Sage, Rose, Jasmine. Blocked: Grief, rigidity, need for control, emotional or sexual trauma, rage, fear, jealousy, co-dependency. Open: Creativity, flow, flexibility, healing, loving relationships, healthy boundaries, depth of feelings, enjoy your sexuality.